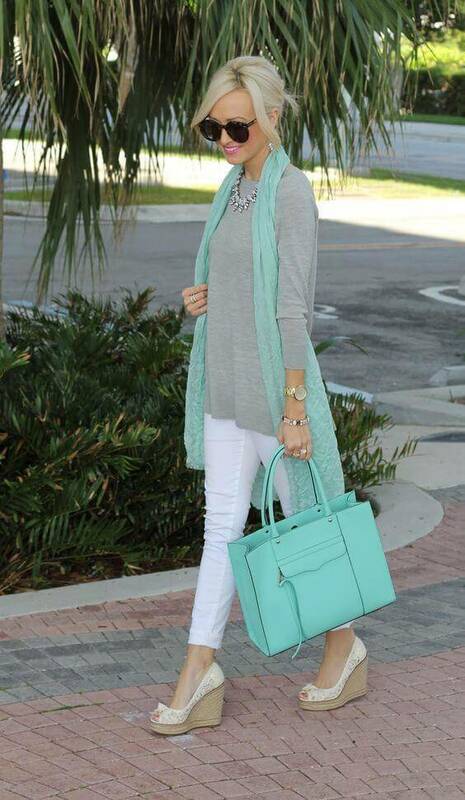 Are you having trouble finding the perfect colors that go well with your mint green clothes? Then ladies you are exactly in the right place as I am here to give you some spectacular color scheme ideas to go with your mint green outfits. The perfect hue of the mixture of blue and green this shade of mint green is ideal to put an essence of freshness to any outfit or apparel. The color can be a fresh shade of turquoise just like the oceans or a bright essence of pistachio green. When these shades of fresh aquamarine and almost peacock blue are put together in the clothing it gives the entire outfit a lively look. The color of mint green or turquoise is fresh but yet so rich that it fills life into any dull outfit with a splash of freshness. Hence, it is a great color to incorporate in your clothes to create attractive and fashionable attire which will not fail to turn the heads to you while in the crown. You will be absolutely stunned with the beautiful shades of colors that go with mint greens. Not matter if you have a mint green shirt or pant, these appealing colors and hues is going to uplift your outfit and personality as well. Have a look and get inspired of all the amazing colors that you can incorporate with mint green. Yes ladies, you saw it right. Bright and vivacious red color goes fabulously with mint greens. The vivid shade idyllically complements the mint green tone and created the perfect balance with a pop of color. Whether it is a mint green top or a skirt or a pant, you can pair it up with a red jacket or even gloved to really bring out the contrast of the outfit. Are you thinking if this combination will look too gaudy? Absolutely not as red color on its own is very bold hence it enhances the mint green component of the outfit very well. Are you looking for a color that would be the perfect playful contrast with mint green? Then this picture will sure inspire you. Yellow is such a vibrant and lively shade and will really help to bring out the blue undertone of the mint green color. This combination will be perfect or any day time outing or a party as well. The mellow tone of the yellow color really gives you a bold yet playful look and this can be carried out by anyone. You can of course pair the mint green top or pant with a more subtle shade of yellow as and the outfit will look drop dead gorgeous.A lighter shade of yellow will complement the color just as much as a deeper shade and will even give a more sophisticated outlook. Who doesn’t love a deep and divine shade of blue? The indigo or deep blue or navy whichever name you pick goes extremely well with mint green. Navy blues looks stunning with mint green outfits and really helps to elevate the entire look. The color is so rich that it really brings out the shade of mint without overwhelming it. Try out this beautiful combo and rest assured that you will be showered with complements wherever you go. You can even incorporate golden accessories to really tie the entire look together. Gold embellishments look beautiful with this combination of colors and give a pop of shine to the outfit. Are you wondering how would more cool tone colors look when incorporated with mint green? Well then I have got some spectacular inspiring photos for you ladies. Beige and cool grey tones are so much in fashion these days and looks absolutely gorgeous with almost any color specially when put together in mint green outfits. The soft and subtle color tone of the beige and greys balances out the entire mint green outfit and gives you very modern and classy apparel. The best part is you can wear this combo absolutely anywhere and any season. This contrast and color combination is very easy to pull off and you can be assured that all eyes will be on you as you walk down in that classy outfit combo. Can we combine colors of the similar group in one single outfit? The answer to that is absolutely you can ladies. As a matter of fact, monotonous and similar color palette outfits are in trend these days and considered very chic and classy. The rich shade of bottle green is another perfect color to combine and mingle with mint green in single attire. The richness in the bottle green will give your outlook a contrast and depth where the cool mint green gives an overall green look to you. Whether you want to wear a skirt or a leggings of mint green palazzos, pairing it will deeper shades of green will create a diva outlook that everyone would love to achieve. Mint green pants are an enigma in today’s fashion industry. The fresh minty shade is nothing less than an epitome of gorgeousness and style. Are you ladies thinking what to wear with mint green pants? Then I have to perfect answer to your queries. These pictures will sure wake the diva within you as it puts out some of the most stylish and chic tops and jackets that you can pair with mint green pants. Whether you are heading to a lunch date or just running the errands, this casual look will be perfect and is absolutely effortless to pull off. Whenever you think of pastels like mint green always remember that white is the easiest option. White goes extremely well with mint green. White tops not only looks stylish and classy with mint green pants but is also a definite head turner on the streets. You can choose a plain white shirt or maybe an oversized flared top like the one in the picture. Best part is, doesn’t matter if it is summer or winter, this shade of color can be worn all year around. Do you happen to have a brown leopard print shirt in your closet? Well then that’s all you need girl to turn around a spectacular outfit with mint green pants. Leopard print tops are high fashion and modish which complements the minty green pants effortlessly. If you want to look chic and stylish then this is the perfect look for you. Brown colored Leopard print never fails to complement solid pastel mint green. Try pairing it with brown ankle boots and a brown leather handbag to achieve that diva look. Short flared coral tops look spectacular with the minty hues and are an ecstatic match for mint green and go hand in hand with each other. If you want to look cheerful achieve that statement look then this combination is just for you. These outfit screams out summer and the combination is sure to leave everyone flattered and awed. Here are some more beautiful outfits that you can easily put together with mint green clothes. We got the summer covered with the coral sleeve less flared tops but we sure cannot leave out the winter now can we? Try this beautiful faux fur jacket with the prettiest shade of coral for the winters with those pop of minty green pants. Whether it is a light or brighter shade of mint green, black blazer never fail to complement the shade especially if you want to wear it to the office. Add in a floral embellished scarf to tie the look together. The black blazer and a baby blue shirt will complement the mint green pants that will enhance your personality. Whether it is an official meeting or just a day at work, this outfit will never fail. Today’s fashion era is all about creativity and you can create hundreds of amazing mint green outfit looks as you desire. These ideas will definitely lift your spirits with the fresh essence of minty green shades and inspire you to recreate this mesmerizing modish looks.